When I first started gardening, I felt like all I wanted to do was plant bright, happy flowers. Shade gardens seemed a little too sleepy to me. With a little more garden experience, (we won’t talk about how much) I have come to absolutely LOVE a shade garden. They can be just as showy as a flower bed, albeit in a subtler way. At least, from a distance. 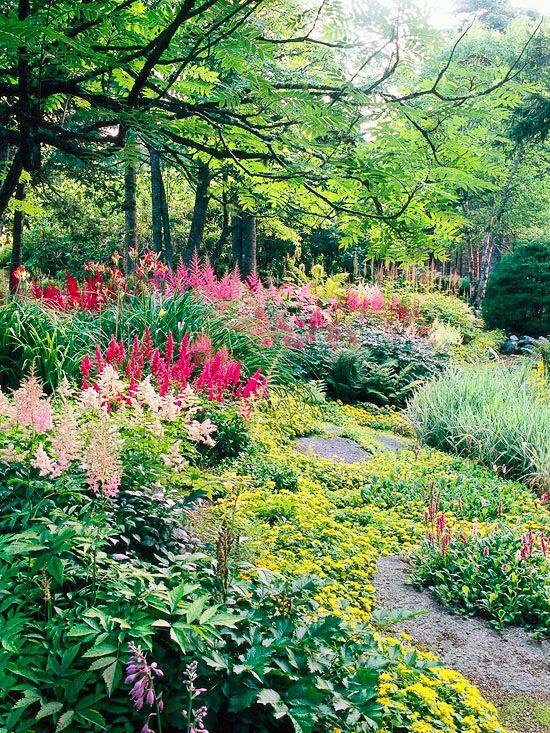 Get up close to a shade garden, and see the incredible textures, colors and nuances that a sun garden can’t match. And shade gardens offers you a feeling of serenity. Maybe that “experience” makes us look a little closer for the details. It’s not all about the big picture. Ah, wisdom. Check out how to plant a shade garden that you can show off! 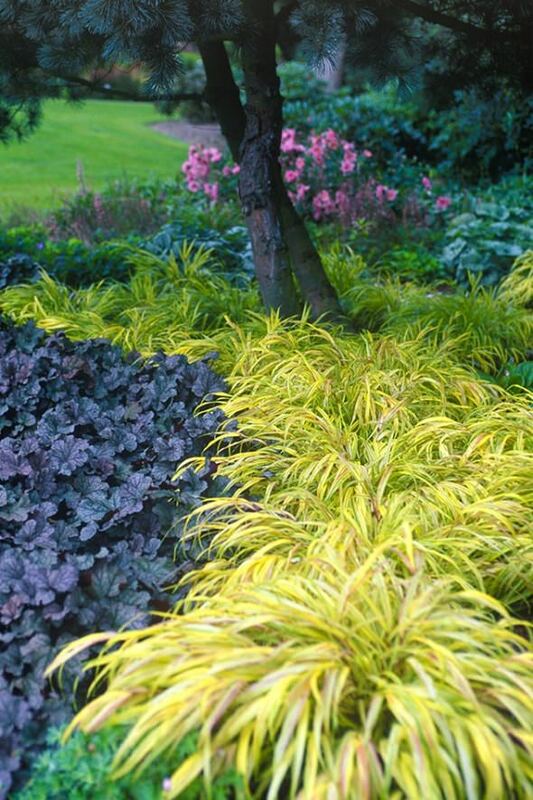 ‘Bressingham Gardens‘ has some amazing examples of color and contrast in shade gardens. 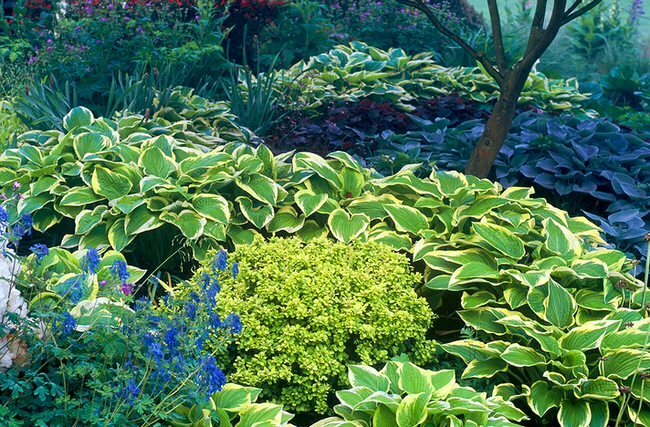 Below, see how simply using different colors of the same plant, Hostas, creates contrast, while also creating unity. I love how the Hostas just lead your eye through the shade garden, like a river. Mass plantings are very effective when used this way. In the second photo, bright green Japanese Hakone grass and deep purple Heuchera set each other off with their contrast in color, and in leaf form. Notice again, the mass plantings flow along like a river, leading the eye. This is also a great way to cover the soil beneath a small tree. Bressingham Gardens photos by Richard and Adrian Bloom. ‘Lonny‘ shows us an easy shade garden idea on how using just one contrasting color in the garden gives us pause, and is an effective design tool in getting our attention. That isn’t the only thing going on here, though. 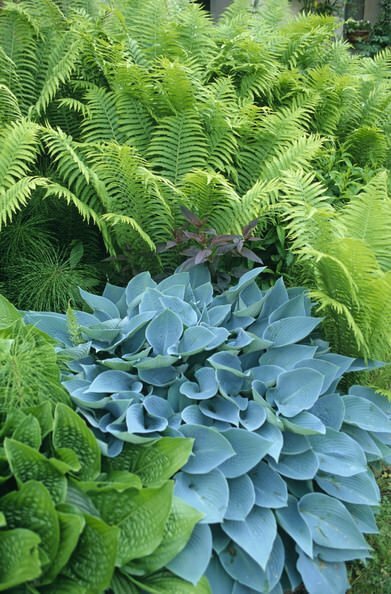 Ferns have long been used next to Hostas, because their fine foliage contrast with the broad, smooth leaves of the Hostas… Instant interest for planting a shade garden..
‘The Gardening Cook‘ brings us this photo from ‘Earth Wood and Flowers’. 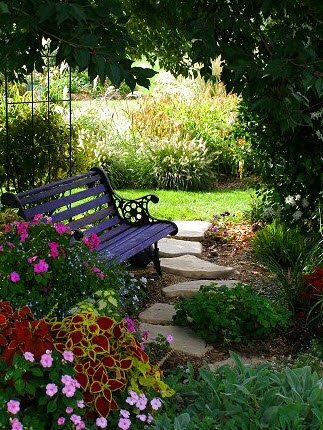 Another technique for enjoying the serenity of shade gardens is to simply place an area to pause, like a bench or seat. It gives the space a focal point, and creates a feeling of rest. It also allows the viewer to get a little closer to the details of the shade garden. 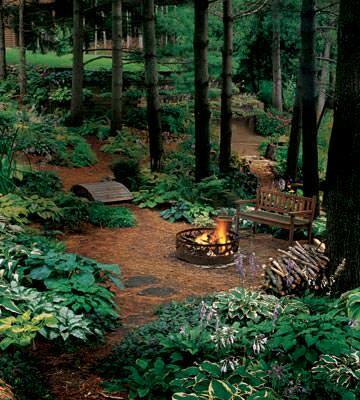 ‘Country Woman Magazine‘ has another idea for a serene garden spot.. A fire pit! When you create a serene resting area like this, then planting a shade garden itself can be simple, such as these mass planted Hostas. Fun fact: I was ‘Country Woman’s’ home decorating expert back in the early 2000’s! Great mag! ‘HGTV Gardens‘ uses a piece of art to create a focal point in a shade garden… combined with out next tip… Using a path to lead you through a space that deserves a casual stroll and close up admiration! Our next two shade garden ideas for using a path through a garden are from ‘BHG‘. This first one ends at a small seating area, giving you a destination to walk to. I love how they use layers of height in this shade garden to give it depth. The taller trees, then the understory small trees, then shrubs, then perennials. Great garden design plan! This is what happens when a walking path and natural stone get married and have a baby. Bliss. Note how they used a shade loving ground cover (in this case, Sweet Woodruff) to soften the edges, just spilling over the stones. A shade garden doesn’t have to be all green, either! This garden from ‘BHG’ shows us how bright flowers can be used to add color. These are Astilbe in pinks and reds. 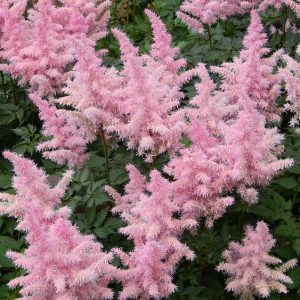 Astilbe are easy to grow, but like rich moist soil and dappled shade the best. Most varieties bloom early summer. If you choose the right plants, you can learn how to grow a shade garden that thrives! Inspired? If you thought of that dull shady spot in your garden as a problem before today, hopefully now you will want to plant a shade garden! 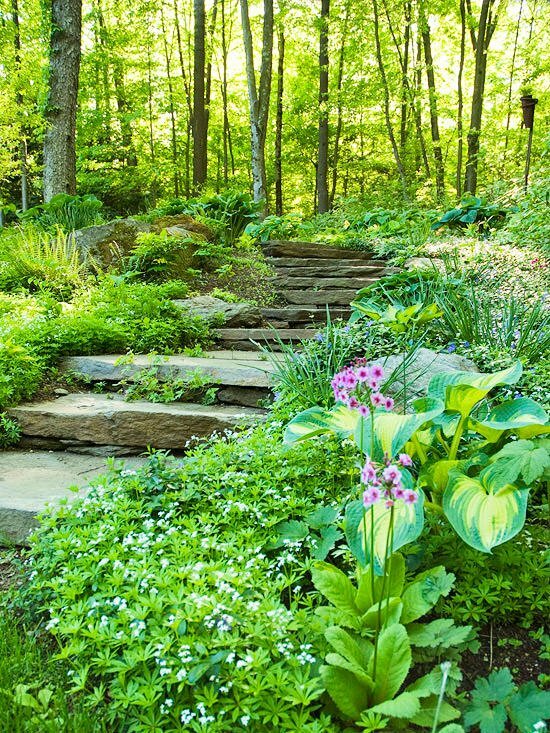 Now jump on over to our posts on DIY Garden Steps and Stairs and 7 Classic DIY Garden Walkways! 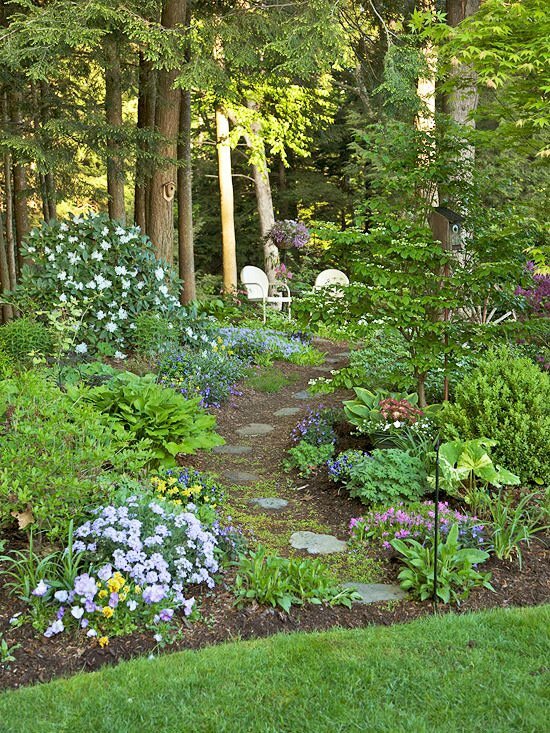 Beautiful Backyards: Inspiration for Garden Lovers! This is al beautiful but what about zones 10 and 11? this super. madam i need plant names pls. Many names were mentioned in the post, but with all those photos of plants, it would be impossible to discern them all, let alone share them! Shade-loving plants in pots are great for under trees that are robbing the soil of moisture and nutrients. I am very happy with my smallish very lush shade garden (maybe 12 by 15 feet around the base of trees. 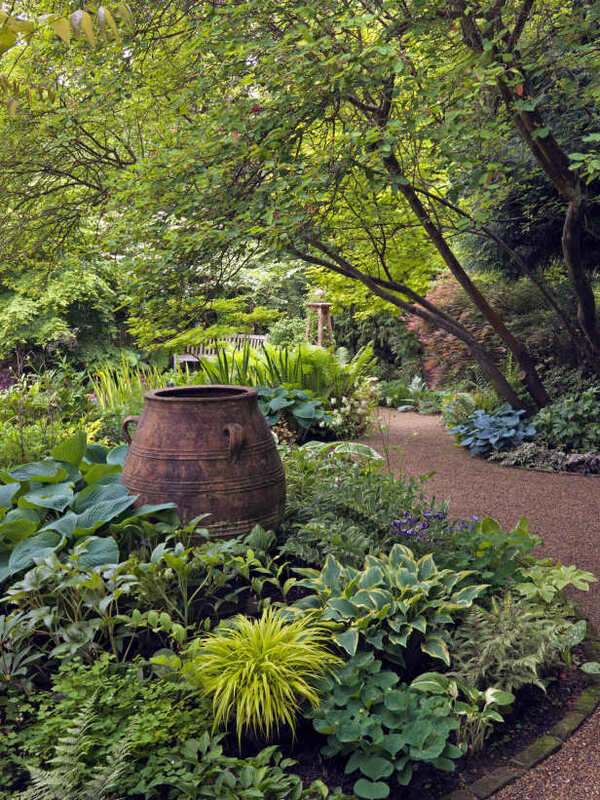 If your shady area is rather large, just concentrate on a favorite spot and use pots there. Pots generally need to be watered, so keep their number manageable, and choose plants wisely. Create lush fullness by choosing plants that grow bushy, and place multiple pots of those to lead your eye through the area. Intersperse with a few single specimens of something you like, for variety and interest.Summers are long, hot and dry where I live, and I have enjoyed my shady spot for years. Thanks for sharing, sounds beautiful…. which plants are your favorites? Wow! That was a beautiful garden, and you just featured an idea that is very helpful and useful. Have you tried raised beds and using shade loving plants? Just adding 6 inches of fresh topsoil on your beds to raise the roots above the tree roots can do wonders! I think maybe if u try the raised bed idea but also try plants that are more drought tolerant but also for shade. Some of my areas in back I’ve done raised beds but also moved plants to a bigger pot & towed the pot into the ground. You want to make sure the spot is even w the ground or the plant may die in winter. Do some of the branches go over your property line? because you are w/i your rights to trim as long as you advise them first. I also use a product called Rootblast (Amazon has) because it gives my plants a real boost fast w growing. Hello Cathy – I solved similar problem by puting a “bamboo root stopper” around my flower beds, or on only the side from which the roots were penetrating my garden. It works very well. It was a hard work initially in some cases we had to cut thru a very thick root, however it pays off. My roses, perennials and other plants are doing very good now – well no one steals their water and their roots now have room to grow. The bamboo root stopper is made of 1,5mm thick rubber, strong enuogh to keep the unwanted roots away. I installed it 12 to 14 inches deep. Get the latest tips and ideas - Subscribe to our awesome newsletter! Successful! - check your email & make sure you click the link in that email to confirm subscription. Get the latest tips & ideas - Subscribe to our awesome newsletter!